Greg is Professor of Environmental Acoustics in the Faculty of Engineering and Informatics at the University of Bradford. 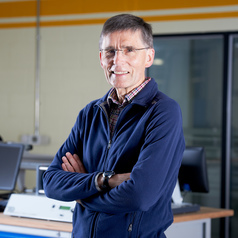 He is an internationally recognised expert on road traffic noise research and was awarded the RWB Stephens medal by the Institute of Acoustics for outstanding contributions to research and teaching. He is a Fellow of the Institute of Acoustics and he has a broad experience of working on acoustics projects for EPSRC, government departments and the private sector. Using live traffic environments and controlled environments, including involvement in fMRI brain scanning techniques, he has studied audio-visual interactions and their importance for environmental evaluations. He has developed methods to predict, map and improve perceived tranquillity and to assess levels of tranquillity in urban and rural open spaces. He was lead researcher on a DEFRA funded study to develop national criteria for identifying Quiet Areas to meet the requirements of the Environmental Noise (England) Regulations 2006. His work in the transportation field, mainly funded by the Department of Transport / Highways Agency, involved a number of high profile psycho-acoustical studies which resulted in effective and practical designs of traffic calming devices such as road humps, rumble strips and more recently 'rumblewave' devices, all adopted for national use. His early work on driver perception has led to the adoption of a hazard identification test for those applying for a UK driving license. He has also developed and field tested locating devices for blind pedestrians at road crossings and station platforms. He currently serves on a number of ISO, CEN and BSI committees concerned with acoustical test methods for noise control products, measurement of tyre/road noise and the definition and evaluation of soundscapes. He was recently involved in drafting recommendations on EC tyre noise regulations for the Department for Transport and later for the EC. This has guided EU legislation on setting new limit values. He was also actively involved in the development of the state-of-the-art Harmonoise/Imagine vehicle source noise traffic noise model part funded by the EU and numerical modelling of sound propagation over complex shaped noise barriers. He has published over 100 papers and articles.